Merge items shows you two items that have the same label or alias. Are they the same topic, and should thus be merged? One button will merge them on Wikidata (and leave a deletion request), the other will mark the pair as “not the same” within the game, not showing this specific combination again. Person shows you an item that has no “instance of” property, but might be a person based on its label (the first word of the label is also the first word in another item, which is a person). 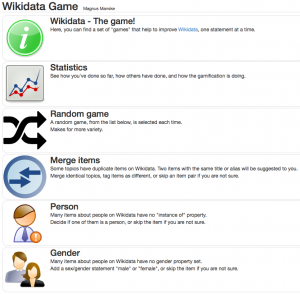 One button sets “instance of:person” on Wikidata, the other prevents it from being offered in this game again. Gender shows you an item that is a person, but has no gender property set. Set the property on Wikidata to “male” or “female”, or skip this item (like you can do with the other games – skipped items will show up again eventually). There is also an option to randomly pick one game each time you press a button in the previous one – slightly more “challenging” than the single-game mode, which one can play at quite high speed. Of course, this simplification misses a lot of “fine-tuning” – what if you are asked to decide the gender of an item that has been accidentally tagged as “person”? What if the gender of this person is something other than “male” or “female”? Handling all these special cases would, of course, be possible – but it would destroy the simplicity of the three-button interface. The games always leave you a “way out” – when in doubt, skip the decision. Someone else will take care of it, eventually, probably on Wikidata proper. Another point worth mentioning is the speed of the game. I took some measures to ensure the user never, ever, has to wait for the game. First, all the potential decisions are made server-side, and written into a database; for example, there are ~290K people waiting for “gender assignment”, and candidates are updated once a day. Upon loading the game website, a single candidate entry from each game is loaded in the background, so one will be ready for you instantaneously, no matter which game you choose. Upon opening a specific game, the cache is loaded with four more candidates, and kept at that level; at no point, you will have to wait for a new page to appear once you made a decision on the current one (I actually had to add a brief fade-out-fade-in sequence, so that the user can notice that a new page has been loaded – it’s that fast). Actions (merging items, requesting deletions, adding statements, remembering to not show items again) is done in the background as well, so no waiting for that either. What else is there to say? The tool requires the user to allow OAuth edits, for both high-score keeping and accountability for the edits through the game. The game interface is English-only at the moment, but at least the main page has been designed with i18n in mind. The games are designed to work on desktop and mobile alike; passing time on the bus has never been that world-knowledge-improving! As a small additional incentive, there are high-score lists per game, and the overall process players have made in improving Wikidata. Finally, the code for the individual games is quite small; ~50 lines of code for the Person game, plus the updating code to find more candidates, run daily. This was written by Magnus. Posted on Tuesday, May 20, 2014, at 21:26. Filed under Wikidata, Wikimedia. Tagged gamification. Bookmark the permalink. Follow comments here with the RSS feed. Both comments and trackbacks are currently closed.